Objectives: The main focus of the current study was to compare the two exercise program, segmental stabilization and strengthening of abdominal and trunk muscles on functional disability in adults with chronic low back pain (CLBP). Materials and Methods: In a randomized controlled trial, fifty patients were randomly selected. Group A patients were treated with segmental stabilization and Group B patients were treated by abdominal and trunk muscles strengthening. 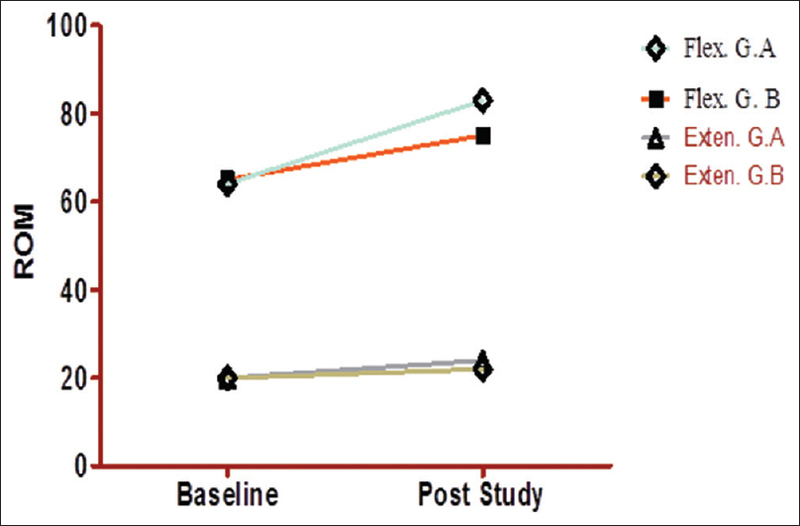 Results: Patients in Group A showed marked improvement than patients in Group B (>0.05). Group A patients who were treated with segmental stabilization showed more significant results than Group B who were treated with abdominal and trunk muscles strengthening in improving disability and pain in CLBP (>0.05). Conclusion: It is concluded from the study that segmental stabilization in patients with CLBP is a significant treatment outcome on numeric rating pain Scale and Oswestry disability index. الأهداف: الغرض الأساسي من هذه الدراسة هو اجراء مقارنة بين برنامجين من التمارين: تمارين تثبيت الفقرات وتمارين تقوية عضلات البطن واثراهما على دم في البالغين الذين يعانون من الألآم الظهر المزمنة في أسفل الظهر. المواد والطرق: هذه دراسة عشوائية محكومة تم خلالها تجنيد خمسين من المرضى اختيروا بطريقة عشوائية وقسموا الى مجموعتين: المجموعة أ: وتم علاجهم بتثبت الجزئي للفقرات والمجموعة ب تم علاجهم بتمارين تقوية عضلات البطن والجذع. النتائج: أظهر المرضى في المجموعة (أ) تحسنا ملحوظا بالمقارنة للمرضى في المجموعة ب (> 0.05). وأظهر مرضى المجموعة أ الذين عولجوا بتثبيت قطعي نتائج أكثر أهمية من المجموعة ب الذين عولجوا بتمارين عضلات البطن والجذع في تحسين الإعاقة والألم في CLBPاسفل الظهر (> 0.05). الخلاصة: خلصنا من الدراسة إلى أن التثبيت الجزئي في المرضى الذين يعانون من الم أسفل الظهر هو نتيجة علاجية هامة في مؤشر العجز في مقياس الالم والعجز Oswestry. Low back pain (LBP) is the second frequent source of disability in the US. According to a report, 0.15 billion workdays/year are wasted due to LBP. It costs about billion dollars annually. Over 80% of the people experience an episode of back pain at some part of their lives. LBP reported clinically to be short duration with almost 95% of patients getting better after a short duration of symptoms appearance. Few of these patients, however, reported not to feel better and suffered from chronic low backache (i.e., chronic mean; pain that lasts for >3 months). Repeated episodes of low backache were also common with a different ratio as ranges from 20% to 44% episode within a year, especially in those with work-related, and this episodic recurrence may range up to 85% throughout life course after the onset. Lower backache that is lasting for >12 weeks is called chronic LBP (CLBP). Chronic low backache may arise from any injury, either stresses on different parts of the body or from different diseases. Various methods are used for the treatment of LBP which includes rest, nonsteroidal anti-inflammatory drugs, Kinesio taping, and electrotherapeutic modalities. CLBP patients are challenged by independent training, despite the existence of various core strength training strategies. There has no standardized system been established for comparing and analyzing the result of core muscles strength training and a typical resistance training. There is an evidence to suggest that core stabilization exercise programs can reduce the recurrence of LBP. Exercises for lumbar segmental stability are planned for NM control and stability (both gross and segmental), not only for lower back muscles but also for the whole spine. The main focus of training involves NM control program was to improve spinal segment stability using control of posture, rhythmical stabilization exercises, transverse abdominis (TrA), and concurrent activation of multifidi segmental muscle. Several studies show the effect of exercise on the lumbar spinal instability and CLBP, but only the clinical symptoms are studied by these researchers, and the results of these studies were not proved by objective measurements up to now. Best clinical protocol integrates both segmental stabilization and superficial muscle strengthening makes difficult to abstract the efficiency of the specific approach. There is very large clinical need and importance to isolate the effectiveness of both strategies through research. For that reason in the study, we compare stabilization exercises and strengthening exercises of low back as well as abdominal muscles in chronic low backache. There is a large clinical need and importance to isolate the effectiveness of both strategies through research. For that reason, a study was conducted to compare the effectiveness of segmental stabilization and abdominal and trunk muscle strengthening in the treatment of CLBP. It was an interventional study. Data were collected after getting the approval from local ethical committee according to the Helsinki Declaration. A total of fifty patients were taken for this study, and the patients were divided into two groups randomly. Group A was treated with segmental stabilization exercises which include strengthening of transversus abdominis, lumbar multifidus, and pelvic muscles, and Group B were treated by strengthening of abdominal and trunk muscles which included external and internal oblique, spinal, latissimus, and rectus abdominal muscles. Patients were given precautionary measures and exercises for low back stiffness, pain, and strength. Patients were assessed on following these steps and finding would be noted on pro forma. A detailed history of the patients was obtained to rule out any active pathology and other causes of included systemic illness. The pain was measured by visual analog scale (VAS) and backache by the Oswestry disability index (ODI) before the treatment and after 2 weeks at last session of treatment. The patients had followed up for 2 weeks having 4 sessions, 2 sessions in a week; each session was lasting for 30 min. All exercise session was performed under the supervision of a physical therapist, and they were strict to report any problem or issue regarding training program and or symptoms. All individuals included in the study were instructed not to participate in any other physical program during the study and not to do exercises at home. At the end of the 2nd-week, improvement of pain was measured by VAS and disability by ODI. Data analysis was carried out by SPSS version 17.0 (SPSS for Windows, SPSS Inc., Chicago, IL, USA). Frequency tables and percentage were used for descriptive analysis. Independent t-test was used to assess the effectiveness and comparison of treatments in LBP. The P < 0.05 will be considered as statistically significant. There were total 50 patients in both groups, the mean age of patients of both groups was 39 ± 11.343 years [Figure 1]a. The most participants were female [Figure 1]b. 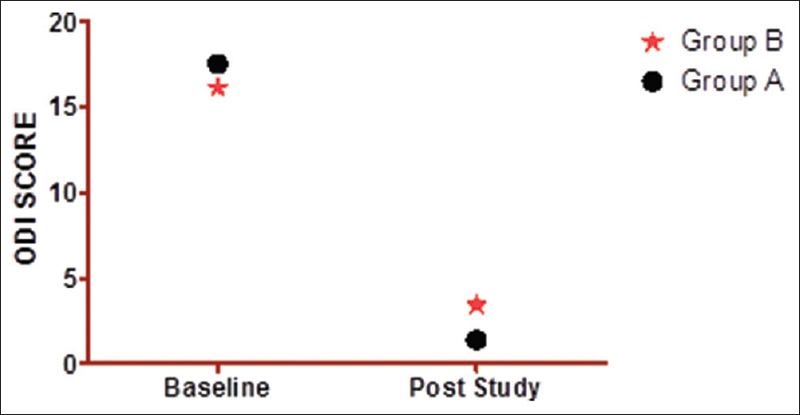 After the treatment, Group A shows marked improvement in pain than Group B [Figure 2]. There was 90% improvement in ODI score in Group A. In Group B, approximately 80% improvement was seen in the mean score of ODI [Figure 3]. Likewise, marked improvement in flexion range of motion was seen in Group A (segmental stabilization group) and Group B (muscle strengthening group) [Figure 4]. The main focus was to examine the effect of segmental stabilization and strengthening (abdominal and back muscles) on CLBP. Ferreira et al. recommended that abdominal exercises improved preactivation of muscles in case of CLBP, which prepared for load bearing. For improvement, SS techniques provide remarkable improvement in pain (99% when it is measured by the VAS and 90% when measured by McGill questionnaire), and the functional disability is improved by 90%. The technique used in segmental stabilization group focused two muscles, which may consider prime causes of a low backache that is why it gives a better result., The patients involved in the muscle strengthening group were asked to perform strengthening exercises of superficial muscles of the lower trunk. There were significant functional capacity improvements and pain relief in the patients included in ST group, compatible with the previous studies as well. Nahhas Rodacki et al. suggested that improved abdominal muscle strength improves low back pain as pressure on intervertebral disks decreased. However, no improvement inactivation capacity of TrA was observed. CLBP occurs most frequently during third and fourth decades of life and affects persons of all occupations and activity levels. For both groups, the mean age is 39.00 ± 11.343 years. The minimum age was 18 years in both groups, and the maximum age was 60 years. The study comprises of 40 female patients and 10 male patients. Difficulties were faced in receiving active participation of male patients; moreover, difficulties were seen when ascertaining the true prevalence of CLBP because it is frequently puzzled with other conditions. According to Bergmark both superficial and deep muscular system are important. Deep muscles form the local systems that are directly involved with joints, and on strengthening these muscles, by avoiding articular micro movements stabilized the segments. Normally, no joint movements are performed by these muscles, which make their contractions intricate and condition getting worse by pain in the low back area. Secondarily, superficial muscles of trunk not only support spinal cord but also helped in lessen compressional forces on vertebrae. Mainly, the superficial muscles control and generate gross movements of lower back, and they rarely provide/helped in segmental stability. Many studies are performed in determining the effect of segmental stabilization on CLBP as well as there are many studies on abdominal muscles strengthening in the effectiveness of CLBP. Some other studies which include strengthening of superficial low back muscles in CLBP are performed. Multiple studies show that stabilization programs for the lumbar region are superior to the generalized programs for patients with CLBP. Not only activation of core muscles is increased by core stabilization program but also it increases core muscle endurance. There is an evidence to suggest that the recurrence of low backache can be reduced with segmental stabilization exercise programs. In addition, improving core strength has been shown to help prevent injury. In individuals with CLBP, segmental stabilization exercises excellently reduced the pain in patients and functional disability. Centers for Disease Control and Prevention (CDC). Prevalence of disabilities and associated health conditions among adults – United States, 1999. MMWR Morb Mortal Wkly Rep 2001;50:120-5. Guo HR, Tanaka S, Halperin WE, Cameron LL. Back pain prevalence in US industry and estimates of lost workdays. Am J Public Health 1999;89:1029-35. Katz JN. Lumbar disc disorders and low-back pain: Socioeconomic factors and consequences. J Bone Joint Surg Am 2006;88 Suppl 2:21-4. Rubin DI. Epidemiology and risk factors for spine pain. Neurol Clin 2007;25:353-71. Carey TS, Garrett J, Jackman A, McLaughlin C, Fryer J, Smucker DR, et al. The outcomes and costs of care for acute low back pain among patients seen by primary care practitioners, chiropractors, and orthopedic surgeons. The North Carolina Back Pain Project. N Engl J Med 1995;333:913-7. Scheele J, Luijsterburg PA, Ferreira ML, Maher CG, Pereira L, Peul WC, et al. Back complaints in the elders (BACE); design of cohort studies in primary care: An international consortium. BMC Musculoskelet Disord 2011;12:193. França FR, Burke TN, Hanada ES, Marques AP. Segmental stabilization and muscular strengthening in chronic low back pain: A comparative study. Clinics (Sao Paulo) 2010;65:1013-7. Freburger JK, Holmes GM, Agans RP, Jackman AM, Darter JD, Wallace AS, et al. The rising prevalence of chronic low back pain. Arch Intern Med 2009;169:251-8. Casagranda BC, Maxwell NJ, Kavanagh EC, Towers JD, Shen W, Fu FH. Normal appearance and complications of double-bundle and selective-bundle anterior cruciate ligament reconstructions using optimal MRI techniques. American Journal of Roentgenology 2009;192:1407-15. Hides JA, Jull GA, Richardson CA. Long-term effects of specific stabilizing exercises for first-episode low back pain. Spine (Phila Pa 1976) 2001;26:E243-8. Javadian Y, Akbari M, Talebi G, Taghipour-Darzi M, Janmohammadi N. Influence of core stability exercise on lumbar vertebral instability in patients presented with chronic low back pain: A Randomized Clinical Trial. Caspian J Intern Med 2015;6:98-102. O'Sullivan PB, Phyty GD, Twomey LT, Allison GT. Evaluation of specific stabilizing exercise in the treatment of chronic low back pain with radiologic diagnosis of spondylolysis or spondylolisthesis. Spine (Phila Pa 1976) 1997;22:2959-67. Ferreira PH, Ferreira ML, Maher CG, Refshauge K, Herbert RD, Hodges PW, et al. Changes in recruitment of transversus abdominis correlate with disability in people with chronic low back pain. Br J Sports Med 2010;44:1166-72. Teyhen DS, Miltenberger CE, Deiters HM, Del Toro YM, Pulliam JN, Childs JD, et al. The use of ultrasound imaging of the abdominal drawing-in maneuver in subjects with low back pain. J Orthop Sports Phys Ther 2005;35:346-55. Hides JA, Richardson CA, Jull GA. Multifidus muscle recovery is not automatic after resolution of acute, first-episode low back pain. Spine (Phila Pa 1976) 1996;21:2763-9. Liddle SD, Baxter GD, Gracey JH. Exercise and chronic low back pain: What works? Pain 2004;107:176-90. Nahhas Rodacki CL, Luiz Felix Rodacki A, Ugrinowitsch C, Zielinski D, Budal da Costa R. Spinal unloading after abdominal exercises. Clin Biomech (Bristol, Avon) 2008;23:8-14. Knapik JJ, Rieger W, Palkoska F, Van Camp S, Darakjy S. United States army physical readiness training: Rationale and evaluation of the physical training doctrine. J Strength Cond Res 2009;23:1353-62. Aruin AS, Latash ML. Directional specificity of postural muscles in feed-forward postural reactions during fast voluntary arm movements. Exp Brain Res 1995;103:323-32.